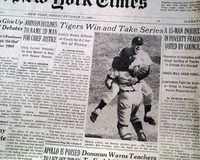 The front page has the 4 column heading: "Tigers Win and Take Series", with a corresponding photo and related text. 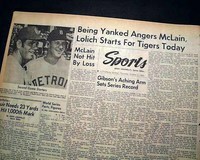 The sports section has considerable details with additional photos. 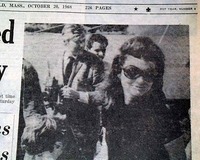 "United States Takes The Lead In Medal Race At Mexico Olympics"
SPRINGFIELD SUNDAY REPUBLICAN, October 20, 1968. 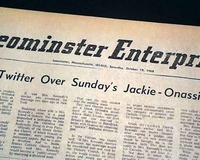 This 82 page newspaper has a two line, three column headline on the front page: "Jackie To Wed Onassis Today" withg related photos and other headlines. Other news of the day throughout. Good condition. 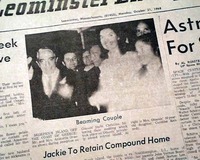 This 10 page newspaper has front page headlines: "Newlyweds Seek Privacy, Elusive Rays of Sun", "Jackie to Retain Compound Home" with related photo and caption: "Beaming Couple"
Tells of the wedding of Jackie Kennedy and Aristotle Onasssis.